Against the versions renewed today, and hardly consistent with reality, the autonomous Zapatista communities, without governmental aid (to the contrary, the Mexican government responds to the original demands of said peoples with a sustained war of low-intensity and exhaustion), have achieved promoting a process of self-government, within which dozens of new villages on lands recuperated after the 1994 Uprising were founded. These, added to the more than one thousand towns that make up the autonomous rebel municipalities (municipios), produce as a result no more poverty and marginalization, as the Diviners of the Power would like, but rather organized regions with their own efficient systems of education, collective health (essentially for prevention), agricultural production for self-sufficiency, independent commercialization of coffee, honey and artesanía. All of that, outside of the induced consumerism, economic dependency and political control that the governmental plans imply in Chiapas. After 1994, the state experienced a virtual agrarian reform, with the appropriation of thousands of hectares of what were ranches and fincas that now are in the hands of the state’s Mayas. We’re talking about up to 700,000 hectares (1.729 million acres) occupied by the Indigenous; the large part, in fact, benefitted those that were not even rebels. The Zapatista rebellion’s influence also reached and benefitted those who stayed on the officialist (pro-government) margins and on occasion have been used to harass, attack and displace the rebels and their indigenous sympathizers. Although systematically denied by the authorities, paramilitarization is a constant fact, with criminal implications and guarantied impunity. In Ocosingo a bloody battle awaited them on the second day, and the largest number of rebels would fall there, among them Comandante Hugo, a respected Tzeltal leader. The federal Army (that attacked coming from Palenque) executed several placed face down, with hands tied in back, but the majority died in combat. The road from the Cañadas was seeded with cadavers of indigenous with the uniform of a campesino army that would redefine the idea of modernity, according to the dominant classes. In the early hours the belief ran around that they were not Mexicans and that they were talking like foreigners. They must be from Guatemala, said the Caxlanes closing up their houses inside. The taking of Las Margaritas seemed almost too easy, where the insurgents confronted the police. 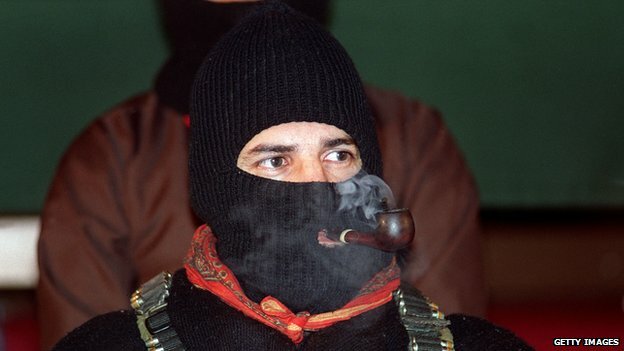 Subcomandante Pedro fell in that action. The world didn’t know him. The peoples of the Tojolabal Canyon carried him back and mourned him with full honors. Except in Ocosingo, the rebels’ withdrawal was unobstructed, almost mysterious. Upon leaving Las Margaritas, the rebels passed through the ranch of the general, ex governor and large landowner Absalón Castellanos Domínguez and took him prisoner. He took many indigenous lives and he would be judged for his crimes. And as in La vorágine, from José Eustasio Rivera, the jungle swallowed him up, or the mountains of the Tzotzil Highlands did. The elites believed that upon 1994 dawning Mexico would be entering the first world as an associate of the northern powers supposed luxury. With the bell tolling of indigenous water festivals in a distant corner of the homeland, the country found itself instead faced with an almost improbable war, of an unpublished eloquence to which no one could be indifferent. Their “¡Ya basta!” changed the rules of the game. The media went en masse from all countries. There was a new player: the indigenous peoples of Mexico. The rest, as they say, is history. With that evaluative style so dear to the neoliberals, now “they ask the Zapatistas for an accounting:” let’s see, what have you done these 20 years? And they cast indicators at them, wrong inferences and ill-intentioned lies. After twenty years, five presidents and eight official governors, the peace has not been signed and therefore the declaration of war remains in effect. The talks between the rebels and the authorities have been few (and the last one occurred 18 years ago). The agreements achieved in San Andrés in 1996 were disavowed the following day by the federal government that had signed them, and since then the Zapatistas are ignored in the census, turned into a thing in the polls, are fought with hidden violence and “shot at” with money under the name of programs, which the comunidades that after their insurrection declared themselves in resistance never accepted. The January fighting lasted 12 días. Hundreds of thousands of people (they talked about a million) went out in the streets to ask for a ceasefire. Since then, a truce exists between the parties, although the government repeatedly violates it (February 9, 1995, with Zedillo’s treacherous military offensive on the communities, and June 10, 1998, with the military attack on San Juan de la Libertad autonomous municipality stand out). The government’s war has not stopped for a single instant. Its fronts are many and not necessarily armed. And nevertheless, in August 1994 the Zapatistas would make an unpublished pronouncement saying that they were an army that aspired to stop being one. In fact, different from what’s common in Latin American rebel movements, they have embarked upon the construction of an autonomous regime, self-sustainable although modest. They vindicate women and don’t owe anyone. They have continued the war without firing a shot; won peace and territory, constructed towns, municipalities and five government centers, called Caracoles, where the very original Good Government Juntas have functioned since 2003. Arriving at 2014, the Zapatista peoples continue reinventing themselves, because they can do it. Their resistance was arduous, they have suffered without bending, and they continue waking up in the morning to celebrate life. A war like no other, is it not?